Today, Oriental Land Company announced plans with The Walt Disney Company to develop a new themed port at Tokyo DisneySea, as well as a new Disney hotel. With this new agreement, and upon the completion of the expansions coming to Tokyo Disneyland and Tokyo DisneySea, the licenses for the Land will be extended to 2076. This newly announced expansion at Tokyo DisneySea will create the eighth themed port, inspired by a magical spring leading to a world of Disney magic and fantasy. 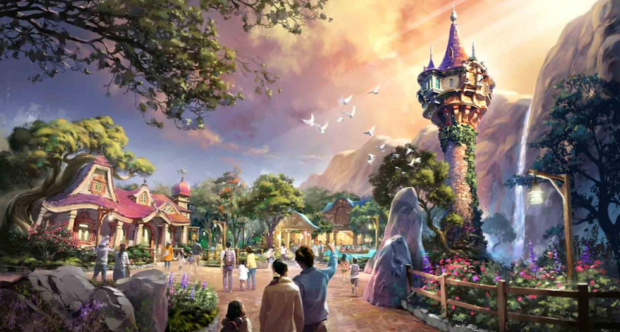 The port will be made up of three areas that recreate the worlds of the Disney animated films “Frozen,” “Peter Pan” and “Tangled,” as well as a deluxe hotel with a one-of-a-kind luxury wing that is set to be the most luxurious accommodations ever at the resort. 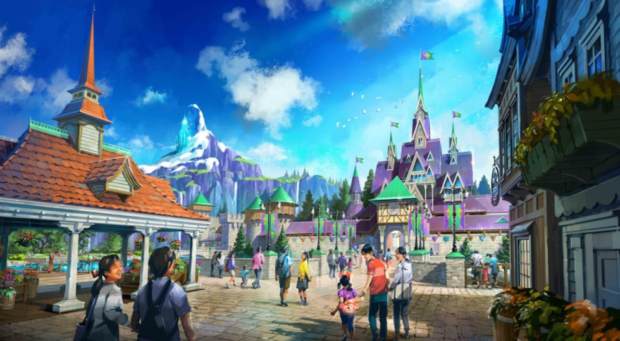 Guests will get to explore the port’s numerous springs, guiding them to Anna and Elsa’s kingdom of Arendelle; the forest and tower where Rapunzel lives; and to Never Land, the home of Peter Pan, Tinker Bell and the Lost Boys. In addition, four new attractions will be developed especially for the expansion, as well as three restaurants, and one merchandise location. Construction is expected to be completed by 2022. Oriental Land Company will invest 250 billion yen into this project, making it their largest additional investment to date for the park. This new area is set in Arendelle after the events of “Frozen,” where Queen Elsa has embraced her ice powers and has opened the castle gates for good. An attraction telling the story of Elsa and her sister, Anna, will be located here. Guests will board boats and travel through the sisters’ journey while enjoying songs from the film and encountering surprise thrills. Also located in this area will be a restaurant set inside Arendelle Castle at the bottom of snow-capped mountains. Guests visiting this section of the port will find Rapunzel’s tower rising high above them in the forest. This area will include an attraction that follows Rapunzel to the lantern festival in the Kingdom of Corona, along with a restaurant inspired by the Snuggly Duckling. A look at the “Tangled”-themed section of the new themed port. In the attraction, guests will board gondolas for a romantic boat tour of Rapunzel’s “best day ever” as she travels with Flynn Rider to the lantern festival. Countless flickering lanterns will illuminate the attraction’s climactic scene where Rapunzel and Flynn sing “I See the Light” as it builds to the finale. This area will be home to two attractions and a new restaurant. The Never Land area will feature landmarks that guests will surely recognize, including the verdant mountains; Captain’s Hook’s pirate ship, the Jolly Roger; and Skull Rock. A look at the “Peter Pan” area coming to the new themed port. One attraction will fly guests over the jungles of Never Land and straight into a battle with Captain Hook and his pirate crew. Guests will join Peter Pan in a quest to rescue Wendy’s younger brother, John, who has been kidnapped by Captain Hook and the pirates. Guests will board boats and follow the Lost Boys down a river. When Tinker Bell sprinkles the boats with pixie dust, guests will find themselves flying through Never Land on an adventure that features iconic music from the film, and 3D imagery of the characters. The second attraction will immerse guests in the world of Pixie Hollow, where Tinker Bell and her fairy friends live and work. 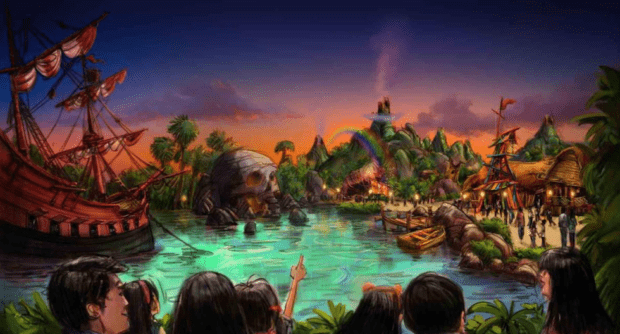 The restaurant in this area will be inspired by the Lost Boys and their hideout, and will offer views of Never Land that guests can enjoy while they dine. 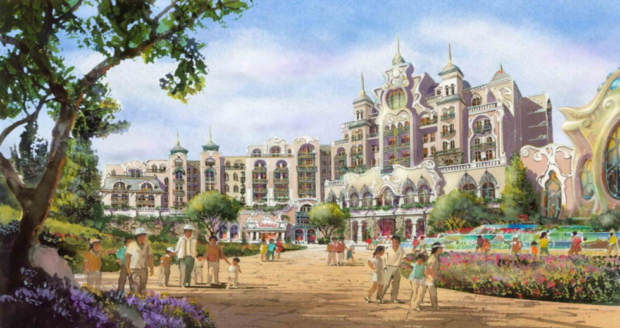 Themed to Disney fantasy, this new hotel will be located inside Tokyo DisneySea. The hotel will rise above the magical springs of the expansion that will serve as the core of the new themed port’s storyline. Park-facing rooms will be available to provide beautiful views of the port’s landscape. The new hotel will offer 475 deluxe-type and luxury-type rooms for guests, with the latter offering the finest accommodations in Tokyo Disney Resort. A merchandise location that will help to share the story of the magical springs will be found on the hotel’s first floor, facing the park. 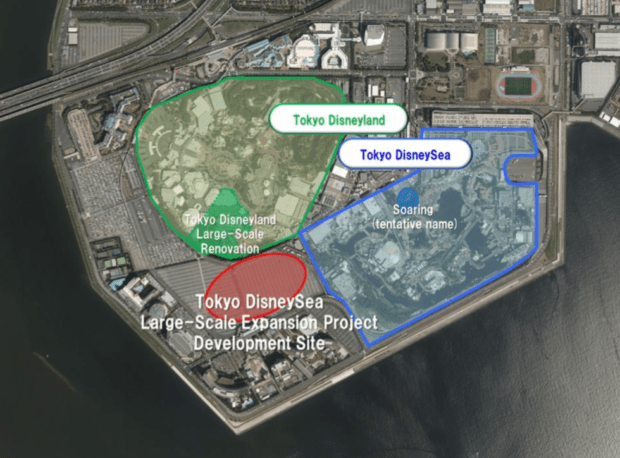 The expansion will be located right in between Tokyo DisneySea and Tokyo Disneyland, in what is currently a guest parking area that will be relocated in order for the project to move forward. The new themed port will be connected to other areas of the park through a pathway between Lost River Delta and Arabian Coast. 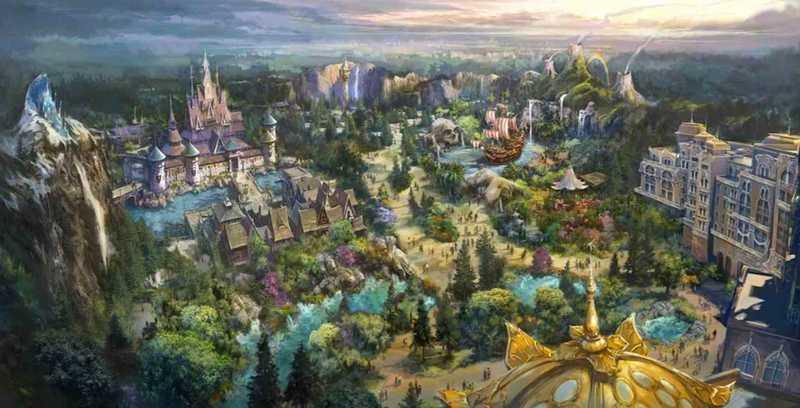 Alongside the large enhancement of Tokyo Disneyland, which is scheduled to be completed in 2020, this new project marks a huge step toward making Tokyo Disney Resort a one-of-a-kind themed resort for guests. To learn more about Tokyo Disney Resort, and to plan your stay, visit TokyoDisneyResort.jp/en.